The Dino Pet is comparable to the modern day Sea Monkeys. Although it is an entirely different creature to Sea Monkeys, it is a similar concept. Designed a electricity, or a great deal of setting up. And once everything is ready to go, they require minimal maintenance to sustain. How long do Dino Pets live? Said to redefine the Plant-Pet paradigm, a Dino Pet works to make science more fun and educate children about the world around them in an exciting and interactive way. Allowing them to own and sustain their own miniature colony of bioluminescent brine shrimp. With the gift industry for children being so competitive it can be difficult to find something that is both fun and educational. It could be the perfect solution as it provides an insight into the world of bioluminescent sea life. These days, only one kind of Dino Pet is available for purchase. So, if you were looking for the top 3 best dino pets, you’ll unfortunately have to narrow your search down. But, that doesn’t mean that you can’t still have a lot of fun with the one kind that is available. Here, we go over the ins-and-outs of the Dino Pet. Dino Pets are made up of a microscopic species of bioluminescent brine shrimp called dinoflagellates. The specific kind of dinoflagellates that come with a Dino Pet are called Pyrocystis fusiformis. Know as the firefly of the sea, the Pyrocystis fusiformis can be found in various warm oceans around the world, including Mosquito Bay in Puerto Rico. Pyrocystis fusiformis will only glow when disturbed, which would naturally happen through the motion of a wave in the sea. The reason that Pyrocystis fusiformis glow when disturbed is to work as a defence mechanism against predators in the sea. When a predator of zooplankton eats some Pyrocystis fusiformis and their mouth suddenly lights up, their immediate reaction will be to spit them back out again. When kept in indirect sunlight during the day they photosynthesize allowing them to let off a blue glow during the night. The glow can only be seen when the Dino Pet is shaken and in the dark. Practically speaking, the Dino Pet could be considered the ideal pet for your child as they do not need much maintenance at all. Dino Pets do not need walking or taking to the vet like a dog or cat might and only require minimal “feeding” as they produce their own energy and food through photosynthesis. The Dino Pet is great for anyone interested in science or anyone looking to spark an interest in science in the younger generation. It gives the owner the chance to witness a real biological spectacle. buy on the mainstream market in April 2014. The Dino Pet is 3D-printed and made from a polyethylene-based plastic, making it slightly less fragile than glass. That said, these are not bomb proof and should still be handled with care. The Dino Pet holds up to 500ml of fluid. This fluid will be a salt water and nutrient mix that comes with your Dino Pet in order to sustain the dinoflagellates. The Dino Pet comes with a detailed instruction manual, including instructions for setting up your pet as well as the best way to look after it. The dinoflagellates themselves come in a bag along with a bag of “Dino Food” which is essentially some nutrient-rich water to give the dinoflagellates a boost and keep them healthy. Both bags need to be carefully poured into the Dino Pet with the base screwed tightly on. Following these instructions is a detailed page about photosynthesis and feeding the Dino Pet. 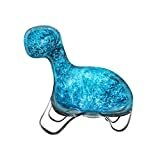 It is highlighted by biopop multiple times that the Dino Pet sould not be kept in direct sunlight due to risk of the dinoflagellates overheating and dying. The information about photosynthesis is informative, scientific, and easy to read. It is clear that biopop worked hard to word their instruction manual in a way that was accessible for people of all ages. 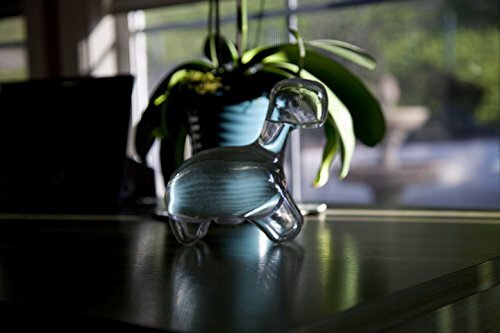 It is highlighted that the Dino Pet needs to be set in indirect sunlight for up to three days to give the dinoflagellates time to settle after the shipping process. Once they have had time to settle, the Dino Pet can begin to glow during the night time or if it is in a dark room. 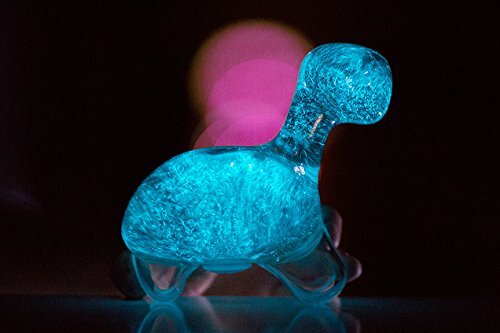 In order to see the dinoflagellates glowing the Dino Pet must be shaken. The instruction manual comes with a warning against shaking the Dino Pet too hard as this can damage or even kill the dinoflagellates. After the Dino Pet has been shaken the Dino Pet should illuminate and should get brighter each week. 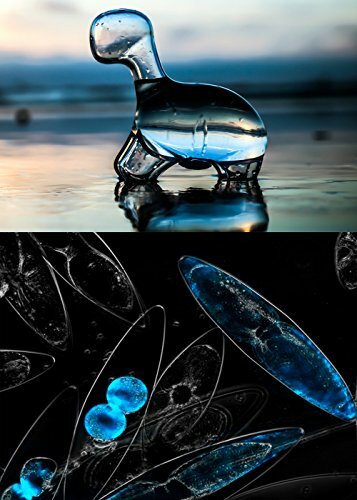 So long as the dinoflagellates are looked after correctly they should multiply and make the glow brighter. The reason that the dinoflagellates need to be shaken in order to become bioluminescent is due to their natural habitat. As dinoflagellates naturally live in the sea they are used to a lot of motion and movement as well as being tossed around in the waves. So it is essential to gently shake the Dino Pet to mimic ocean waves in order to see the dinoflagellates glow. Dino pets are not a toy for young children and are targeted at anyone over the age of 5 according to their instruction manual. While a Dino Pet can be considered low maintenance it is no easy feat keeping the dinoflagellates consistently healthy. They function best and are healthiest when they are kept in a strict light and dark routine. It is advised that the Dino Pet is given 2 hours of light and 12 hours of dark every day and at the same time each day to maintain a steady routine. This can be trying for those who do not have a regular routine at home. It is also stated in the instruction manual that if the dinoflagellates do not get at least 30 minutes of darkness before shaking they will not glow. In order to keep the dinoflagellates strong and healthy it is recommended that they are fed biopop’s specially formulated Dino Food”. The instruction manual indicates that the Dino Pet should be fed every 4 to 6 weeks. However, the dinoflagellates do have the ability to grow for several months without extra nutrients from “Dino Food” so long as they have the correct lighting exposure. This is because dinoflagellates are able to make their own food through photosynthesis. When using the “Dino Food” the Dino Pet must be half emptied and then topped up with the Dino Food fluid. To read the full instruction manual click here. Biopop guarantee that the dinoflagellates will arrive alive and healthy. Once they arrive however, keeping them alive is up to you. There are two key factors to consider to help keep a healthy and happy Dino Pet. Dino Pets should be kept between 65-75 Fahrenheit. The species of dinoflagellates present in a Dino Pet are used to warm waters that they would typically thrive in naturally. If the dinoflagellates get too hot or too cold they can die. As mentioned previously, dinoflagellates are highly dependent on sunlight. Ideally a Dino Pet should be kept on a strict 12 hour routine of light followed by 12 hours of darkness. It is also vital that the Dino Pet is not kept in direct sunlight as this can damage the dinoflagellates and even cause them to die. If the Dino Pet is given too much sunlight it can cause them to overheat and they will die if they are exposed to temperatures higher than 75 Fahrenheit. The typical lifespan of an individual dinoflagellate is between seven and fourteen days. So, in order to maintain a healthy Dino Pet, the right environment needs to be provided to sustain a healthy population. The population of dinoflagellates in the Dino Pet can survive and sustain themselves for between one to three months through photosynthesis. It is recommended by biopop that regular use of Dino Food will extended the life of a Dino Pet. It is claimed that the Dino Pet can live indefinitely as long as it is given the right light and temperature, as well as having regular top-ups of Dino Food. However, most typically the Dino Pet will live for around 3-6 months. The biopop profile on their campaign website states that the Dino Food will last around six months and costs for a very low price. When it comes to getting your hands on a Dino Pet the starting price was a bit costly from the biopop website. The Dino Pet price is very affordable within mainstream retailers including Amazon and Walmart. However, as of 2017 these Dino Pets are no longer in production or circulation, so getting your hands on one can be tricky. If you are keen to get hold of one there are some listed on eBay. While the Dino Pet is a unique and interesting product the fact that it is no longer available or in circulation implies that they may not be worth it. Various reviews online state that the Dino Pet didn’t last very long or died within the first couple of weeks. 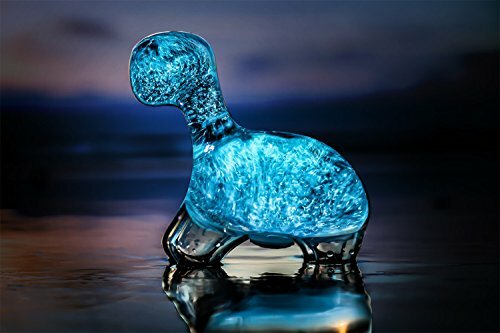 Some even claim that they never experienced a glow from their Dino Pet, implying that the dinoflagellates must have died before they arrived, or that the right conditions were not achieved to keep them alive. Even though the Dino Pet could be considered low maintenance and easier to look after than a conventional pet like a dog or cat, they do need care and attention. The more care given to a Dino Pet the longer they will live. However, they do have quite a limited lifespan. Most Dino pets are expected to survive for up to three months. This can be extended with the regular use of Dino Food, however, it can be a lot of money to consider for something that will not last very long. It would be the ideal gift for someone enthusiastic about science and biology. But, it raises the question of how quickly the novelty would wear off if the dinoflagellates only provide light when shaken. If you are interested in buying a Dino Pet from an online marketplace like eBay, make sure you approach with caution. 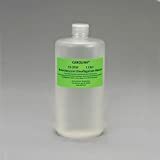 The original creators have discontinued the product so there is no guarantee the dinoflagellates will be alive and healthy when they get to you. Also consider the fact that Dino Food, which is needed to sustain a healthy population of dinoflagellates, has been discontinued. The Dino Pet territory is unchartered waters now and there will be no support or help from the Dino Pet creators. If you are interested in having a bioluminescent pet at home you could try making your own. It is possible for you to get hold of the same species of dinoflagellates or Pyrocystis fusiformis from this website. Once you have purchased the dinoflagellates you could keep them in a sterilized, screw top glass jar for the same effect as a Dino Pet. A bioluminescent pet is a different and exciting way to interest someone in science and similar results can be achieved in a more DIY format. If you refer to the original Dino Pet instruction manual for advice on creating the best environment for dinoflagellates, why not have a go at creating your own colony of bioluminescent Pyrocystis fusiformis?